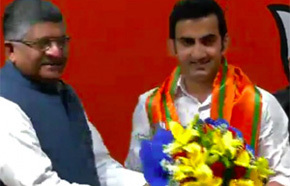 NEW DELHI: Former cricketer Gautam Gambhir joined the Bharatiya Janata Party ahead of the upcoming parliamentary elections on Friday in the presence of Union Ministers Arun Jaitley and Ravi Shankar Prasad. He is likely to be fielded from a Delhi constituency. An awardee of Padma Shri, Gautam Gambhir claims that he has been influenced by the ideas of Prime Minister Narendra Modi. "Let's leave it to the country's Election Committee. For now we are happy he joined the party," BJP leader Arun Jaitley, present at the announcement made at the party office, said. He did not name the constituency for Gambhir. Gautam Gambhir, 37, had announced his retirement from all forms of cricket in December 2018. The Ranji Trophy played between Delhi and Andhra Pradesh was his last match. "The next Ranji trophy match against Andhra will be my last game in the sun. It is all coming to an end from where it started at Feroz Shah Kotla... As a batsman I have always valued timing. I know the time is just right and I am sure it's sweet as well," Gambhir had said in a video announcement. Speaking at BJP headquarters in Delhi, Gambhir said, "I thank the party for giving me this opportunity. I am joining this party after being inspired by Prime Minister Narendra Modi's vision. It's an opportunity for me to do something for my countrymen. I look forward to doing my best." It has been reported that he may be fielded from New Delhi constituency, represented by party leader Meenakshi Lekhi. He had been articulating his views on politics for quite some time on social media. On the issue of famrer suicides, he blames political parties for their inaction. He had recently joined issue with National Conference leader Omar Abdullah on Kashmir terrorism.